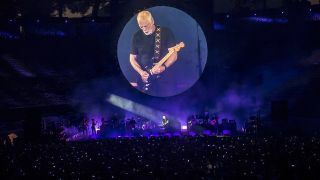 David Gilmour has released a live video of his performance of Pink Floyd classic Comfortably Numb. It’s been taken from his Live At Pompeii concert film, which launched in 2017 – and the clip has been shared to promote his upcoming guitar auction which will take place in June. The video sees Gilmour playing his famous 1969 black Stratocaster which will be one of the instruments going under the hammer – and it’s expected to sell between $100,000 and $150,000. Speaking last week to announce the auction of 120 of his guitars, Gilmour said: “These guitars have been very good to me and many of them have gifted me pieces of music over the years. They have paid for themselves many times over, but it’s now time that they moved on. A tour of the instruments will launch at Christie’s in King Street, London, between March 27-31, where fans will be able to see the full collection. A select number of the guitars will then move to Los Angeles on May 7-11, which will then be followed by a sale preview in New York ahead of the auction which will take place between June 14-19. David Gilmour returned to Pompeii in 2016 – 45 years after Pink Floyd played the Roman amphitheatre for Adrian Maben’s iconic film Pink Floyd Live At Pompeii.